"Boats are the nearest things to dreams that hands have ever made." Southern Cross Blue Cruising is an Australian/Turkish/American owned, gulet charter company based in Bodrum, Turkey operating under a Turkish Tourism Charter Licence utilizing over 17 years of yachting and charter experience combined with local Turkish knowledge and resources. We are a small, committed, hands-on team dedicated to consistently deliver the perfect yacht charter experience in Turkey and Greece. Dave Stanley has a background in wooden boat-building, a marine painting business and professional motorcycle racing. Dina Street is a dual Turkish/American national and has degrees from the University of California, Berkeley in Applied Mathematics and Near Eastern Studies, having set up the first internet cafe in Turkey in 1997. ﻿What sets us apart from other gulet charter companies is our passion for wooden yachts, Turkish hospitality and culture, a dedication to the finest local cuisine, and our hands-on approach with planning every detail of our guests' holidays together with them. We own and operate three gulets and are very involved with the day to day activities in our boatyard, as well as with our crew. When you call us, you will always reach one of us at all times and not an intermediary. We are proud to have fewer rather than more gulets in our charter fleet, as it allows us to be intimately involved with each boat and with each client. The magic of a personal, family or group private gulet charter is about enjoying time with people of your choice, indulging in personal service, full housekeeping, gourmet meals, absolute relaxation and a very flexible itinerary. Known for their world famous hospitality and expertise, your crew will take you to exotic destinations in Turkey and Greece, prepare gourmet Mediterranean cuisine, pour drinks and take extremely good care of you. Relax in the shade on the aft or forward deck of the gulet, sunbathe, read a book, swim, snorkel or chat with friends and family. Explore Turkish villages in Gökova , hike in pristine pine forests around Marmaris, and shop in the local Bodrum and Göcek fresh markets. 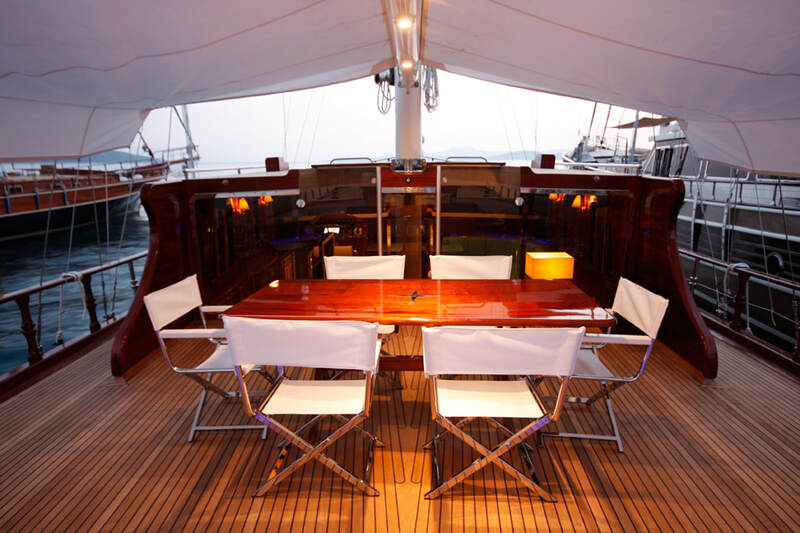 The choice is always yours as the itinerary on your gulet is always flexible. When you discover an anchorage that you particularly love, then you can spend extra time there. At night, if you're in the mood to groove, you might want to go ashore and enjoy local Turkish nightlife in Bodrum, Gocek or Marmaris. Or, you may prefer to fall asleep to the sounds of the sea in a quiet secluded cove whilst others party away nearby. With a private gulet, it’s the beauty of having the choice.